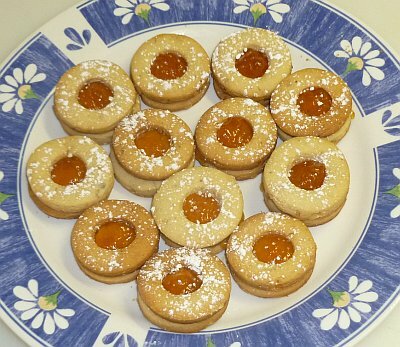 These cookies consist of two butter cookies sandwiched together with apricot preserves, although other fruit preserves may be used. Beat butter, chopped pecans and sugar until light and fluffy. Add egg and vanilla, mix well. Add flour previously sifted with the baking powder. Mix until dough forms. Keep the dough cool and flatten it to a thickness of 4 mm (3/8 in) with a rolling pin on a cutting board covered with plastic film. Cut the dough with a round cookie cutter. 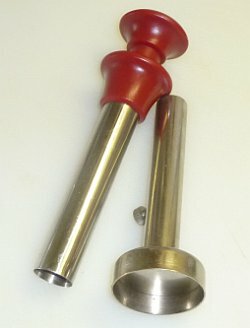 For half of the cookies, cut out a center hole with an apple corer (See image below). Place the cookies on an ungreased baking sheet. Bake for 20 min. at 375 degrees F or until lightly browned. When the cookies have cooled, place half a teaspoon of preserves on each cookie without a hole, and then lightly press the cookies with a hole on top of them. Sprinkle the cookies with powdered sugar.